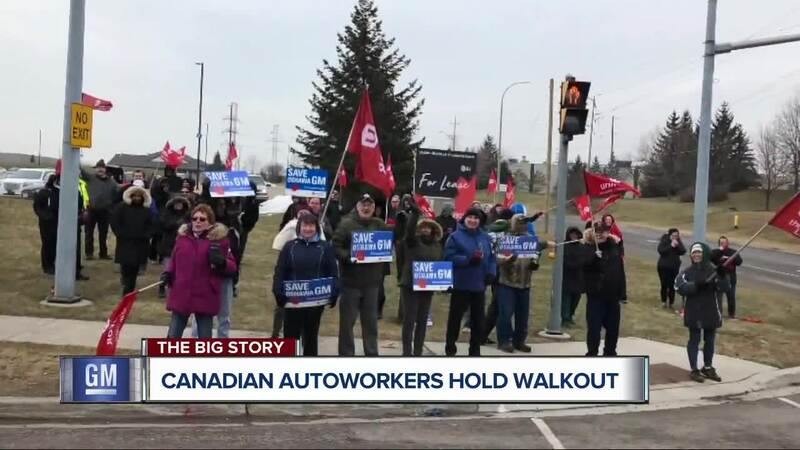 Canadian auto workers staged a third walkout since General Motors announced in November it will be closing 5 plants this year and eliminate 14,000 jobs. A thousand workers at Inteva Products walked out this morning and plan to keep the plant idle until tomorrow morning. The plant makes interior parts and is a feeder to the GM Oshawa, Ontario plant and the Detroit Hamtramck plant, two of the plants set to close. COBO CENTER (WXYZ) — Canadian auto workers staged a third walkout since General Motors announced in November it will be closing 5 plants this year and eliminate 14,000 jobs. A thousand workers at Inteva Products walked out this morning and plan to keep the plant idle until tomorrow morning. The plant makes interior parts and is a feeder to the GM Oshawa, Ontario plant and the Detroit Hamtramck plant, two of the plants set to close. Unifor President Jerry Dias said at a Detroit news conference this is a continuing campaign to hit GM where it lives and hurt GM. Oshawa would be the hardest hit area with 2,500 hourly workers affected and 500 salaried jobs lost. “General Motors just wishes we would be quiet and go away. The chances of that happening are zero,” Dias said. Unifor is also driving a truck around the Motor City as part of the campaign. Michigan’s new governor, on the job only 15 days, was asked what she’s done to address General Motors. Two of the plants set to close are the Detroit Hamtramck assembly plant and a transmission plant in Warren. “I understand how people are felling, but until I’ve got more information directly from the company I’m not going to go so far as to castigate anyone,” the governor said.